Circadian rhythm sleep disorders (CRSD) are a family of related sleep disorders, all characterized by an inability to sleep and/or wake at normal or appropriate times due to the dictates of the individual’s biological or circadian clock. As a result, sleep is attempted (or actually occurs) at an abnormal time in the individual’s circadian cycle, rather like having jet lag all the time. Usually, the sleep is of normal quality, and even its quantity would be usually sufficient if allowed to start and finish at the times dictated by their body clocks, but often this does not fit in with the schedule required for normal work, school or social needs. 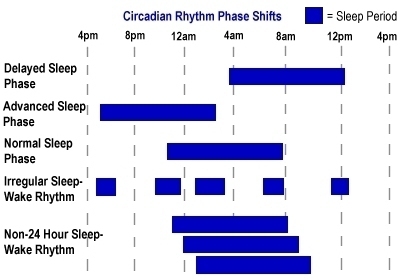 The body’s circadian rhythm controls things like core temperature, alertness, appetite, hormone secretion, etc, over the 24-hour day, and it also influences the times of day when a person is ready to sleep and wake (see the section on Circadian Rhythms). If the person’s extrinsic circumstances are such that they are not able to keep to this internal timetable, then sleep patterns may be impacted, sometimes severely. 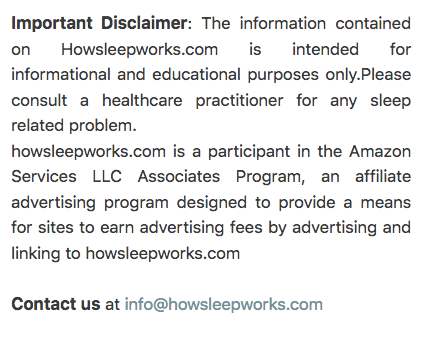 Thus, the problem is not that sufferers are unable to sleep, but that their natural schedules are not compatible with the schedules and demands of modern life, leading to an accumulating sleep debt and daytime sleepiness. CRSDs are normally only diagnosed as such when the phase advance or phase delay differs from the norm by at least two hours (i.e. it is more extreme than just an individual’s tendency towards being a “night owl” or a “morning lark” due to their chronotype). In the case of a CRSD, the phase shifts may be three to five hours or more. delayed sleep phase syndrome (DSPS), the most common CRSD, frequently found in adolescents, teenagers and depressives, where a person naturally has a much later-than-normal timing of sleep onset, and may experience peak alertness very late in the evening or even in the middle of the night. There is some argument to be made that this is not actually a disorder in teenagers at all, but a normal (if unexplained) phase of the development of the human circadian clock. advanced sleep phase syndrome (ASPS), the opposite case, most common in the elderly, where a person naturally has difficulty staying awake in the evening (feelings of sleepiness often set in as early as the late afternoon) and difficulty staying asleep in the morning. As with DSPS, this is arguably a normal part of aging. non-24-hour sleep-wake syndrome (non-24), mainly found among blind people with no light perception (who are therefore unable to receive the usual environmental time cues or Zeitgebers), in which a person’s alertness and performance patterns are totally desynchronized from the normal 24-hour day. Sleep tends to occur one or two hours later and later each day, following a so-called “free-running” cycle of 25 hours or more – the complaint is sometimes called free-running disorder – typically taking a few weeks to complete a full cycle. irregular sleep-wake rhythm disorder (ISWRD), mainly found in sufferers from Alzheimer’s disease and other forms of dementia, where a person takes numerous naps at irregular times throughout a 24-hour period, with no main nighttime sleep episode (also known as polyphasic sleep). Total sleep time may be roughly similar to normal, but the sleep pattern is highly irregular and socially impractical. Body temperature also tends to fluctuate wildly throughout the 24-hour period, although usually in sync with the person’s sleep tendencies. Most of these disorders are largely genetic in origin, ofen involving the PER and CLOCK genes. Treatments may include bright light therapy (bright light at desired wake-up times, and darkness at desired sleep times) and chronotherapy (gradually resetting the circadian clock by manipulating bedtimes). Oral melatonin supplements to induce sleepiness, and a strict schedule of good sleep hygiene are also useful tools. Shift work and jet lag (see the separate sections on Shift Work and Jet Lag) are sometimes included as circadian rhythm sleep disorders, and may be referred to as shift work disorder and jet lag disorder. Certainly they arise from same root cause (circadian rhythm phase shifts), although the reasons for their incidence are more social and occupational than medical.